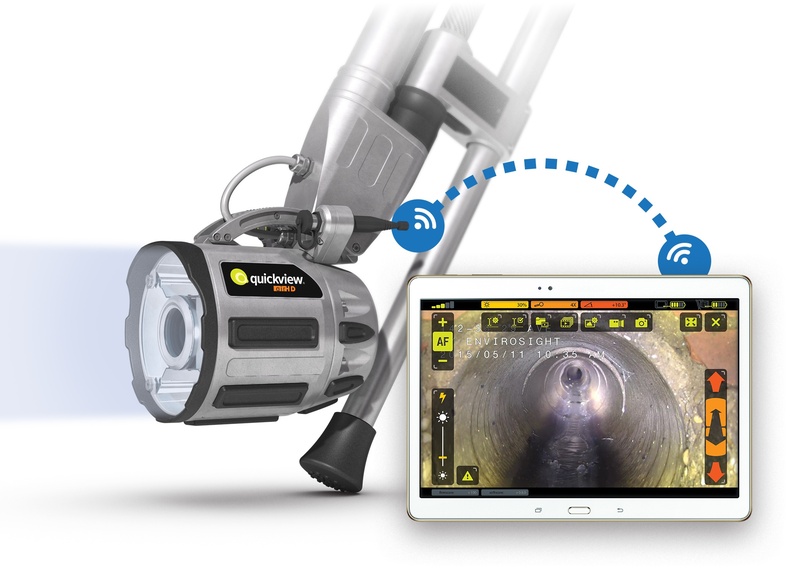 Envirosight’s New Quickview airHD Sewer Assessment Camera Delivers Live Wireless HD Video with Touchscreen Tablet Controls. A quantum leap in zoom assessment technology, the new cable-free Quickview airHD camera captures high-definition (HD) video from sewers, and transmits it wirelessly to a touchscreen tablet for live viewing. A quantum leap in zoom assessment technology, the new cable-free Quickview airHD camera captures high-definition (HD) video from sewers, and transmits it wirelessly to a touchscreen tablet for live viewing. With the Quickview app installed, the tablet offers fingertip control of zoom, illumination, and tilt, as well as image capture and video recording/playback/annotation/sharing. And because the camera has motorized tilt, as well as in-manhole centering capability and hands-free stabilization, set-up takes virtually no time at all, and both the operator’s hands remain free to operate the tablet. At the heart of the new Quickview airHD is an HD zoom camera with 30X optical zoom (plus 12X digital) paired with Envirosight’s new Quad-Haloptic light engine. The camera is tuned to deliver maximum detail from within pipes, and the light engine combines four offset LED/reflector pairs to surround the camera with powerful, focused illumination that is perfectly aligned for maximum range and optimum viewing at any distance. The camera acts as an ad-hoc Wi-Fi network, allowing any device running the Quickview app to connect for full control, or as a view-only client. The camera is powered by a lightweight, rechargeable lithium-ion battery. Two batteries are supplied with each system to allow continuous operation on a swap-out basis. The Quickview app, which offers all viewing and control functions, installs on iOS and Android tablets. With it, an operator can connect to the camera head to stream live HD video while controlling the camera’s zoom, focus, illumination intensity and tilt. Alternately, bystanders can connect in view-only mode to observe inspections in progress. Within the app, an operator can capture video and still images, organize them in the onboard library, review and annotate footage, and easily share results. Static and dynamic text (including camera tilt, GPS coordinates and illumination settings) can be overlaid on video, and the app is easily updated as new feature enhancements become available. The Quickview airHD camera head connects to the pole with a secure quick-release. To adapt to the widest range of manhole depths, the 4-foot pole jackknifes open to 8 feet. Either or both halves of the pole can then telescope for a maximum length of 12 or 16 feet. Available pole extensions adapt the system to deeper manholes and catch basins. A centering foot at the base of the pole maintains the camera’s centerline view in pipes ranging 6 to 48 inches diameter, and is adjusted simply by pressing down against its internal gas spring (a reciprocating ratchet holds the position). For complete stability, a clamp on bracket holds the top end of the pole, simultaneously freeing the operator’s hands for operating the tablet. Except for the pole and centering foot, all system components travel in a hard-shell roller case. The new Quickview airHD is available for on-site demonstration from Envirosight’s worldwide network of regional sales partners. Trusted by more than 2000 users worldwide, the patented Quickview zoom survey camera evaluates pipelines, manholes and tanks from street level. Contractors use it to survey pipe condition before bidding services, and to document completed work. Municipalities use it to identify and prioritize maintenance issues, avoid confined-space entry, and inspect hard-to-reach infrastructure. Departments of transportation use it to assess culvert and storm pipe condition with minimal exposure to traffic. Quickview’s patented Haloptic illumination technology delivers more light precisely where it’s needed, and requires no midstream realignment. The Quickview and Haloptic names and logos are trademarks of Envirosight, LLC. Quickview carries patents 6,538,732 and 7,009,698.